A study published online in Annals of Surgical Oncology reports that a week-long course of accelerated partial breast irradiation (APBI) after lumpectomy reduced rates of breast cancer recurrence and led to a 10-year survival rate of 96 percent. APBI is a localized form of radiation treatment meant to eliminate breast cancer cells that may remain after lumpectomy surgery. Lead author Dr. Mitchell Kamrava, MD, of UCLA, and colleagues analyzed 10 year outcome data for APBI in the form of multicatheter brachytherapy which involves placing several catheters into the breast which surround the area where the tumor used to be in almost 1400 women treated with breast-conserving surgery between 1992 and 2013. The median age of the women was 59 years, and 73 percent had invasive ductal carcinoma, while 18 percent had ductal carcinoma-in situ. All of the patients underwent lumpectomy and multi-catheter brachytherapy APBI administered over 5 days. After a mean follow-up of almost 7 years, the researchers found that patients had a 10-year risk of ipsilateral (on the same side) breast tumor recurrence of 7.6 percent. Cause-specific survival was 96.3 percent. 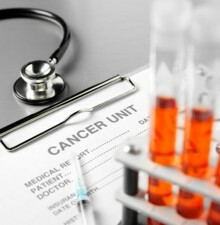 Distant metastasis (cancer that has spread from the original tumor to distant organs) was 3.8 percent. Regional failure (recurrence in regional lymph nodes that were not included in the original radiotherapy field) rate was 2.3 percent. "While we await the results of level 1 evidence, these data provide valuable information that 5-day APBI in appropriately selected women can be considered as an alternative to conventional 6- to 7-week external-beam whole-breast irradiation (WBI)," the authors conclude. Currently, adjuvant extended-course whole-breast radiation lasting about 6 7 weeks is the standard treatment for many types of early-stage breast cancer. However, this study adds to previous evidence that short course APBI may be a safer, more convenient alternative.